Difference between revisions of "Involuntary Ejection"
In GTA Vice City, more conditions for a dismount were added; in addition to impacts with vehicles and buildings, the player can also be thrown off when leaning the bike too far back during a wheelie, too far forward during a stoppie, or while the motorcycle is rolling backwards over a certain speed. This remained unchanged in GTA games which recycled GTA Vice City's game engine (GTA Liberty City Stories and GTA Vice City Stories). [[Bicycles]], which debuted in GTA San Andreas, are particularly vulnerable — unlike motorcycles, hitting pedestrians full one with a bicycle will throw the player from the bike. Improved bike and cycling [[statistics]] improve the player's ability to hold onto a motorbike or bicycle during low-impact collisions, or while rolling backwards. [[Bicycles]], which debuted in GTA San Andreas, are particularly vulnerable — unlike motorcycles, hitting pedestrians full on with a bicycle may also throw the player from the bike. Improved bike and cycling [[statistics]] improve the player's ability to hold onto a motorbike or bicycle during low-impact collisions, or while rolling backwards. [[Grand Theft Auto IV]] continues to apply the same set of rules with regards to motorcycle dismounts, this time using [[Euphoria|Euphoria animations]] after players are thrown from their bike; this makes it difficult to predict the degree of injury the player may sustain. In GTA IV's single player, even a minor to moderate collision may propel the player off their bike; susceptibility to dismounts is adjusted, however, in GTA IV's episode, [[The Lost and Damned]]. As [[Johnny Klebitz|the protagonist]] in The Lost and Damned is more accustomed to motorcycles than [[Niko Bellic]], the risk of him being thrown off a bike is much lower. Multiplayer modes in all GTA IV-based games typically minimizes chances for player dismounts, in order to let the player focus more on the game and less on the consequences of driving. Involuntary ejections from a car or aircraft is a feature introduced later in the series, in [[Grand Theft Auto IV]] and [[GTA IV Episodes|its episodes]]. If the player is traveling at a high speed and smash head-on into an object or vehicle (particularly an immobile one) head on, there is a chance they will be ejected through the windshield. The windshield then will shatter as the player is flung forward out of the vehicle, from which point the [[Euphoria]] animations causes the player to roll and bump to a stop, inflicting damage with each impact. The feature also applies to the game's helicopters. It can be assumed that the protagonist may not wear a seat belt, at least on certain occasions, resulting in the tendency for him to be thrown out. Involuntary ejections from a car or aircraft is a feature introduced later in the series, in [[Grand Theft Auto IV]] and [[GTA IV Episodes|its episodes]]. If the player is traveling at a high speed and smash head-on into an object or vehicle (particularly an immobile one) head on, there is a chance they will be ejected through the windshield. The windshield then will shatter as the player is flung forward out of the vehicle, from which point [[Euphoria]]-powered ragdoll game mechanics causes the player to roll and bump to a stop, inflicting damage with each impact. The feature also applies to the game's helicopters. It can be assumed that the protagonist may not wear a seat belt, at least on certain occasions, resulting in the tendency for him to be thrown out. Although being ejected from the windshield is unlikely to kill a protagonist with decent health, the player may be thrown into oncoming traffic, risking collisions which will cause major damage. If a player is ejected straight into an oncoming vehicle (especially in places where traffic moves fast, such as a highway), the player risks being killed. Like dismounts in GTA IV, the effects of such an ejection can be catastrophic if the player is low on health. If the player is wearing a helmet on a motorcycle and they are ejected, impacts on the player's head will not cause damage. The player and an NPC driver dismounted from their motorbikes in GTA 1, as a result of a head-on collision. An involuntary ejection is an occurrence in the Grand Theft Auto series when the player or an NPC is involuntarily thrown off or out of a vehicle, commonly as result of a collision. This feature primarily serves as a penalty for reckless driving, and attempts to simulate a certain degree of realism in the game's vehicular accidents. The tendency for the player to be thrown out of vehicles varies among vehicle classes and models; hitting any NPC's vehicle at a high speed with a large vehicle may also result in their ejection. In Grand Theft Auto 1, the player will be thrown forward from their motorcycle if they collide with vehicles past a certain speed. This feature offsets the motorcycles' superior maneuverability and nimble nature, and discourage recklessness. Players lose health when thrown. Motorcycles were missing from Grand Theft Auto 2 and Grand Theft Auto III, but subsequently appeared in every GTA game from Grand Theft Auto: Vice City onwards, with the exception of Grand Theft Auto Advance; they continued to feature involuntary dismounts. 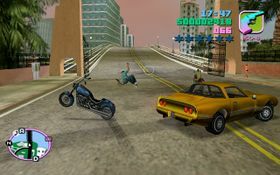 The player being ejected from a Freeway in GTA Vice City. Bicycles, which debuted in GTA San Andreas, are particularly vulnerable — unlike motorcycles, hitting pedestrians full on with a bicycle may also throw the player from the bike. Improved bike and cycling statistics improve the player's ability to hold onto a motorbike or bicycle during low-impact collisions, or while rolling backwards. Grand Theft Auto IV continues to apply the same set of rules with regards to motorcycle dismounts, this time using Euphoria animations after players are thrown from their bike; this makes it difficult to predict the degree of injury the player may sustain. In GTA IV's single player, even a minor to moderate collision may propel the player off their bike; susceptibility to dismounts is adjusted, however, in GTA IV's episode, The Lost and Damned. As the protagonist in The Lost and Damned is more accustomed to motorcycles than Niko Bellic, the risk of him being thrown off a bike is much lower. Multiplayer modes in all GTA IV-based games typically minimizes chances for player dismounts, in order to let the player focus more on the game and less on the consequences of driving. Niko Bellic having been ejected through the windshield of an Oracle after a high-speed collision with a lamppost. Involuntary ejections from a car or aircraft is a feature introduced later in the series, in Grand Theft Auto IV and its episodes. If the player is traveling at a high speed and smash head-on into an object or vehicle (particularly an immobile one) head on, there is a chance they will be ejected through the windshield. The windshield then will shatter as the player is flung forward out of the vehicle, from which point Euphoria-powered ragdoll game mechanics causes the player to roll and bump to a stop, inflicting damage with each impact. The feature also applies to the game's helicopters. It can be assumed that the protagonist may not wear a seat belt, at least on certain occasions, resulting in the tendency for him to be thrown out. NPCs also has a chance of ejecting out of the vehicle when colliding into objects head-on, similar in effect to when the player is ejected. This event can be achieved readily by the player by driving head-on into NPC traffic with enough force. High priority NPCs spawned by the script are scripted to not be affected by involuntary ejection, so there is no worry about causing involuntary deaths of important characters. Bail out, a voluntary ejection from a vehicle.